When you’re expecting your first child, you’re up to your neck in baby gear registries, “must-have” newborn items, and hand-me-downs from friends with older kids. As the due date gets closer, you find your house filling up with swings, bouncy seats, baby carriers, and high chairs; not to mention toys, clothes, and that adorable fuzzy bear snow suit that you just had to buy. At some point, you look around and think, “Surely we won’t need to buy anything else for this kid!” But the thing no one warns you about is this: the accumulation of stuff only gets worse as the kids get older. They grow like weeds, going through clothing and shoe sizes like tissues. They develop mentally and physically, moving onto new toys and mercilessly ignoring last week’s favorites. And then comes school. The pictures, the projects, the mementos that couldn’t possibly be thrown away; the homework, lunch boxes, lunch containers, jackets, and shoes; and the daily whirlwind that has parents everywhere going crazy every morning at 730am. You’re busy enough just keeping up with today’s hectic schedules and keeping your living space from looking like a Toys R Us after a hurricane; you don’t always have time to constantly sort, declutter, and store old stuff properly. I get it. I have nine year old twin boys and we have dealt with plenty of organization challenges over the years. I have also helped many clients facing the same challenges. How can you maintain a beautiful, comfortable, relaxing home without letting your kids’ stuff take over completely – or worse, spending all your time picking up after them? As an interior designer and home organizer, I have one mission: help families attain grown-up style, ease, and efficiency in their home while creating kid-friendly spaces the whole family will love. In this post, I’m going to share some of my favorite tips for setting up kid-friendly spaces that let kids be kids without losing the style and organization adults crave. But first, here’s why, as a professional designer and organizer, I’ve dedicated my business to helping families organize their homes: kid clutter can be a very real source of stress, wasted time, and conflict in many households. When your house is always messy with toys, clothes, and papers scattered about, you tend to feel less comfortable in your own home and less able to relax. Clutter has even been linked with higher levels of the stress hormone cortisol in women. As parents, we’re constantly faced with two unpleasant choices: either spend much of our free time picking up after messy kids, or nag and argue with our kids over and over to try and get them to clean up after themselves. Good interior design and home organization won’t completely change those two choices, but it can significantly decrease the amount of time and energy it takes to clean up or get things done. Imagine the amount of time you spend haranguing your kids in the morning cut in half because everything they need is already in one clear place! Conquer the toy clutter by working with it, not against it. That means, instead of constantly bemoaning the ridiculous number of toys in the house, just make sure you have ample shelving, baskets, cubbies, and under-the-bed storage. That way, you don’t find yourself piling toys on the floor or throwing them into the closet just to get them out of the way. But there’s an even better way to approach toy storage: make sure it is going to be easy for your kids to access from a young age. The earlier they can reach and put away their toys on their own, the sooner you can teach them to pick up after themselves and play independently. Always a good thing! These are a great way to set up a temporary space for kids to build and then easily put the project away to work on later, so it doesn’t have to take up floor space all week. 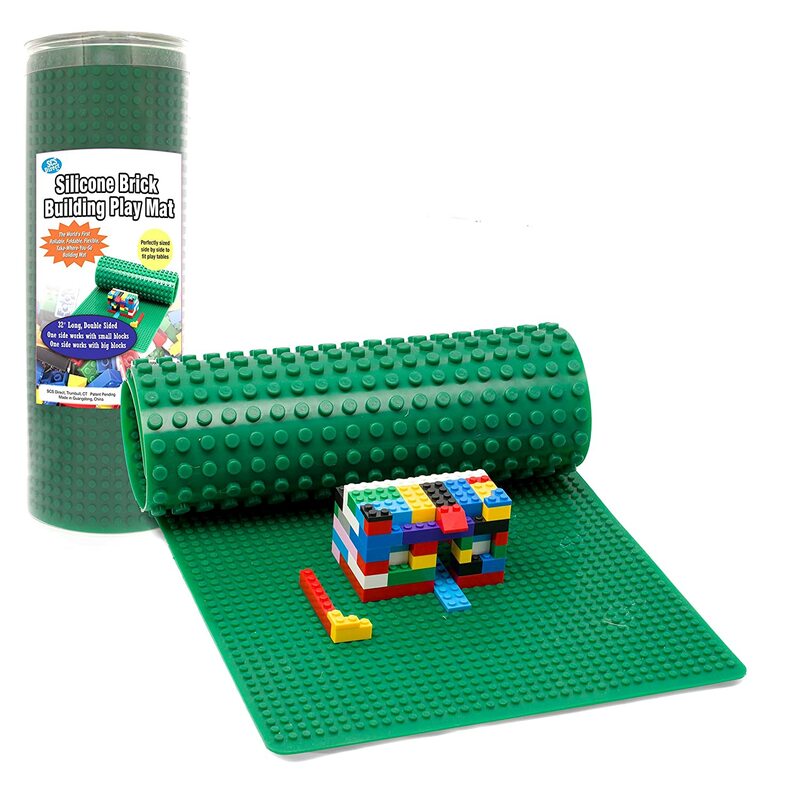 Along the same lines, a roll up mat can be more easily stored when not in use. Boxes and drawers are great for under-the-bed storage, but I love this under-the-bed play mat too. 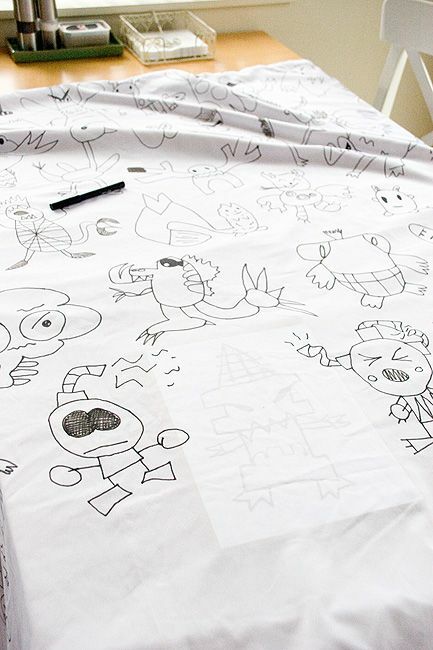 These bags are 100% cotton canvas toy bags that double as play mats. So when it’s time to clean up, just “swoop up” the bag with the cords on each side, tie the cords, and hang the bag on a hook. Done! For more ideas on organizing kid bedrooms and play rooms, check out my Pinterest board for kid spaces. Mornings with school-age kids can be hectic. I can’t be the only one who has sent their kid to school late with mismatched socks! 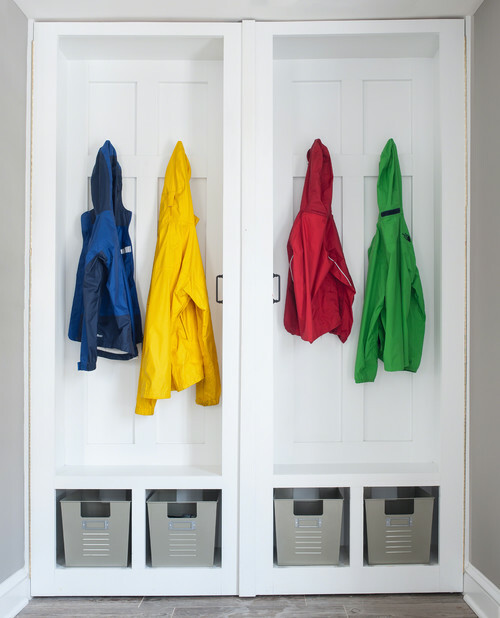 If your home has a mudroom or other spacious entry way, lucky you! A little organizing may be all you need. I find that it really helps to give each person their own designated space. Naturally, make sure hooks and cubbies are height appropriate so even your littlest ones can learn to be self-sufficient. Pro Tip: Keep a message board by the door for important reminders (e.g., Monday piano lessons) or sweet notes to send them out the door with love. If you don’t have the luxury of designated entry space, you don’t need a ton of room to make one of your own. Consider hanging a staggered row of hooks on a bare wall for an easy solution (Command Hooks) with a spot for shoes and boots below. Baking sheets covered with stones or cooling racks are a cute, crafty way to keep muddy shoes off your floors. Kids tend to come home with a stack of papers and treasured artwork every week – or even day. Much like assigning a spot for each person’s backpack, it helps to have a designated spot for each child’s papers, too. I just love the wall-mounted, magnetic magazine pockets by Three By Three. Get one for each child plus an “in” box for papers that need to be looked at or signed. Kids these days are BUSY and someone has to keep track of where everyone is supposed to go. My favorite method is a family calendar that lives right along side the paper and homework space. You may still be the commander-in-chief of the schedule, but as your kids get older the family calendar will help them take responsibility for their social, school, and extracurricular life. Every child has unique needs for homework and project space. Some might need peace and quiet while others need a little activity or the motivation of mom looking over their shoulder to keep them on track. Consider what works best for your child. While there are no set rules, giving kids separate space often works the best. To avoid distractions or melt-downs over lost scissors, keep school and art supplies easily within reach. I love the idea of using containers that you already have on hand to store anything from crayons to erasers to colored pencils. 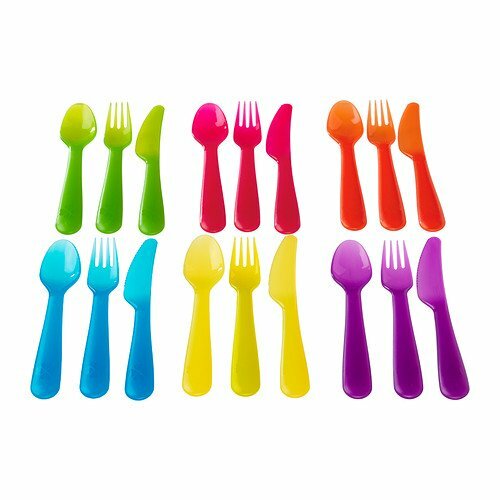 Unless your child buys lunch every day, chances are you have lunch boxes, baggies, thermoses, and cutlery spilling out of your cupboards. To stop the sack lunch insanity, designate one cupboard for all things lunch and label categories clearly. I also like to have a designated set of utensils that is just for lunch and lunch prep (no sharp knives or pokable objects) so your kids can assist in lunch making responsibility. At the end of the day, have your kids empty out their lunch boxes and put things back where they belong. No more stinky milk cups! The most important part of all of this back-to-school prep? Making sure your kids are on board with this vision for smooth-sailing school days. 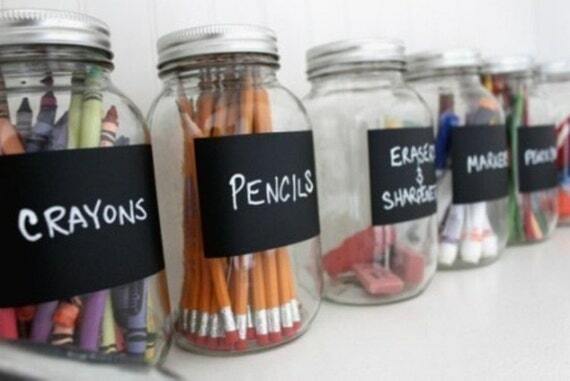 Label designated areas clearly and review with the whole family so everyone is on the same page. You might even practice prepping a school lunch and have a picnic out on the lawn. If you have a school-age child, chances are good that you also have a deluge of delightful artwork piling up around the house. You can’t possibly keep, or showcase, it all. But you can’t possibly disappoint your little Picasso either. 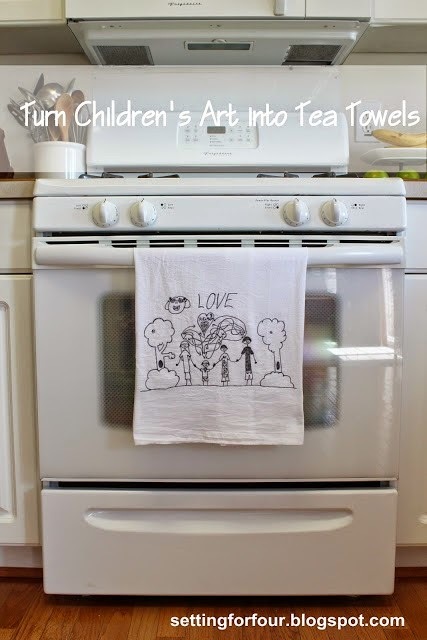 Here are some of my favorite ideas that will leave your kid feeling artistically applauded while adding a little life to bare walls. I love this idea because it works with frames of all shapes and sizes and you don’t have to worry about the cost (and fragility) of glass. Create a uniform look by choosing or painting frames in a single color or mix it up with a touch of something bold or bright. 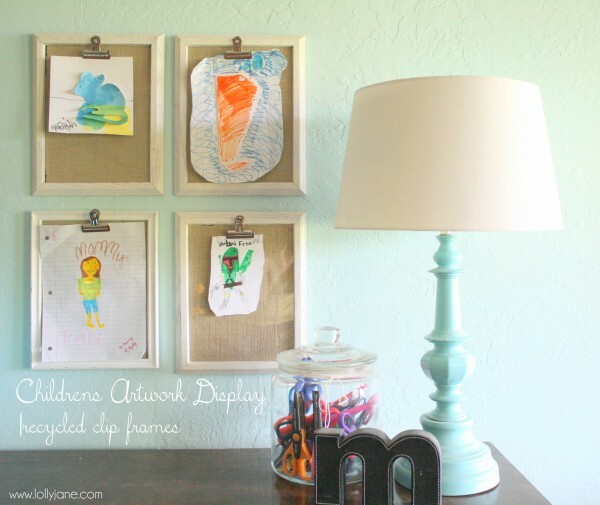 Simply string wire across the frame (on the inside) and use a clothespin or cute clip to hang the art. It’s easy to rotate in new pieces or create a collage by layering multiple pieces in a single frame. I actually love this idea for all kinds of eclectic art, and all you need is a few clipboards. You can paint the clipboards in a uniform color to showcase the art or leave them as is for a more funky, arts and crafts feel. Most clipboards already come with a hole for hanging, so this creative idea really couldn’t be much easier. 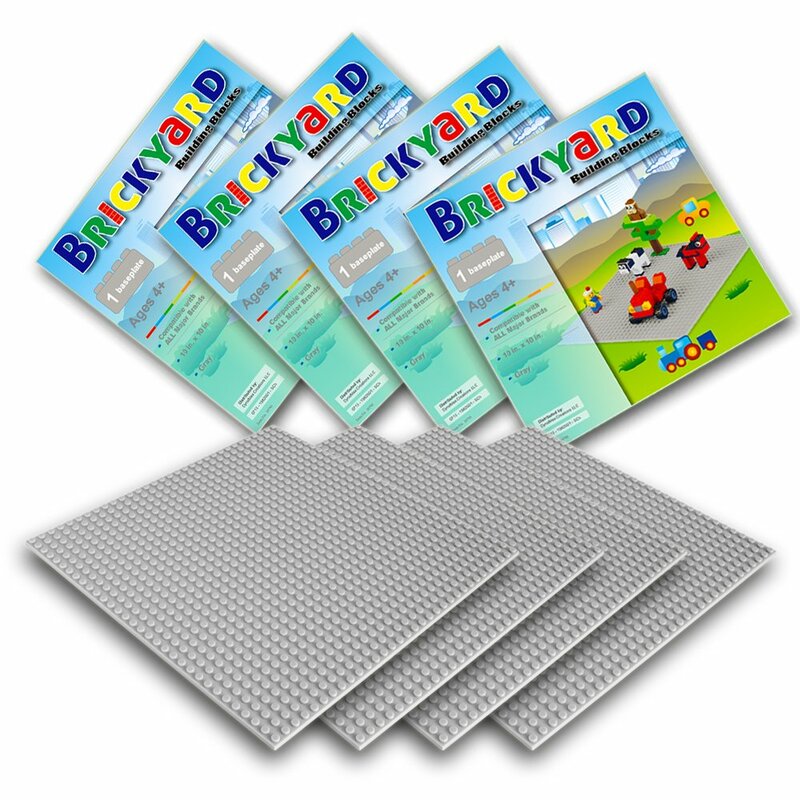 The durability, ease, and casual style of these heavy-duty plastic page protectors make them a great way to display art in kids’ rooms. With grommets already in place for easy hanging and thick, durable plastic that will stand up to tiny hands, your kids will have a ball creating a dynamic gallery of their favorite work. 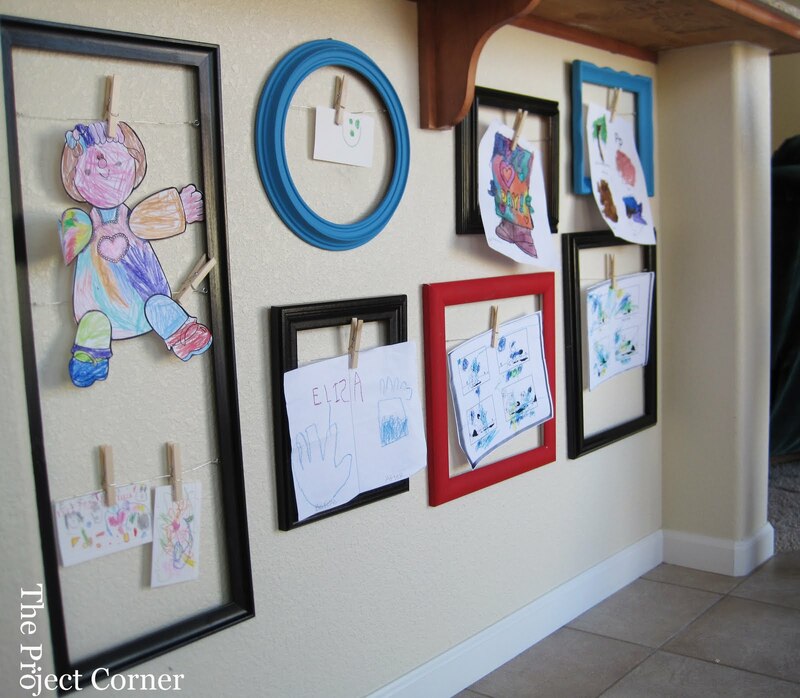 This is a super cute way to create a collection of your little one’s art. And while the end result looks sophisticated, it’s quick and easy to execute. Simply scan artwork using your home scanner and then shrink individual pieces down to a uniform size. Print, position in a large frame, and hang! This idea is both cute and efficient – a winning combo in my book! These Lilian Vernon frames let you store up to 50 pieces and easily rotate your favorites for display. BONUS! I couldn’t resist adding just one more of my favorite recommendations. Mantle Art has an easy-to-use app that lets you snap a picture of a piece of art and then experiment with a variety of framing options before you buy. Once you select and order the frame and optional mat, they send you a protective sleeve or tube with prepaid shipping to send the artwork back. In a few weeks, you receive your beautifully framed artwork, ready to hang! One of my favorite solutions is to repurpose paper art projects into gift items and objects that are easier to integrate and use around the house. Think placemats, tea towels, and even duvet cover! For larger pieces that you want to save, storage can pose a challenge. Consider labeling mailing tubes with your child’s name and age and combining all the pieces from a single year. Math tests and spelling stories may not be as flashy as art projects, but it doesn’t necessarily make them less meaningful for your child. 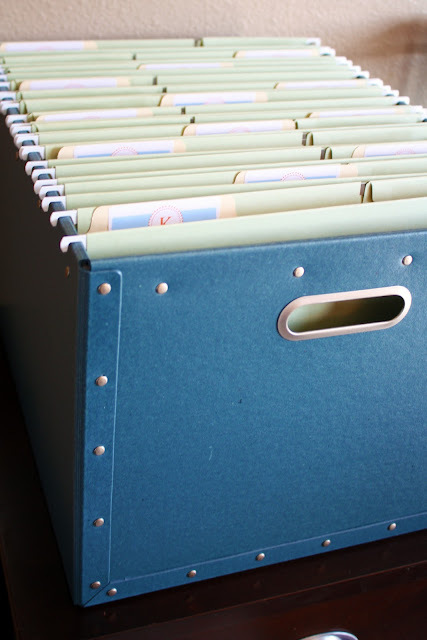 I like using a simple storage box like you’d find at an office supply store with files labeled for every year. This gives you a place to store papers as they are dumped out of backpacks, but also forces you to keep only those that fit in a single file folder once the school year ends. If you have more storage space or want to hang on to projects that don’t fit in a file, you can use a separate storage box for every year. Finally, I’m a big fan of the binder. It feels a bit more like a scrapbook and is easy to page through when you want to reminisce. It’s so great to have active, engaged kids. But in addition to ride shares and crazy schedules, every extra activity is bound to come with photos, at least, if not also medals and awards. Once again, the answer is to repurpose and get creative. 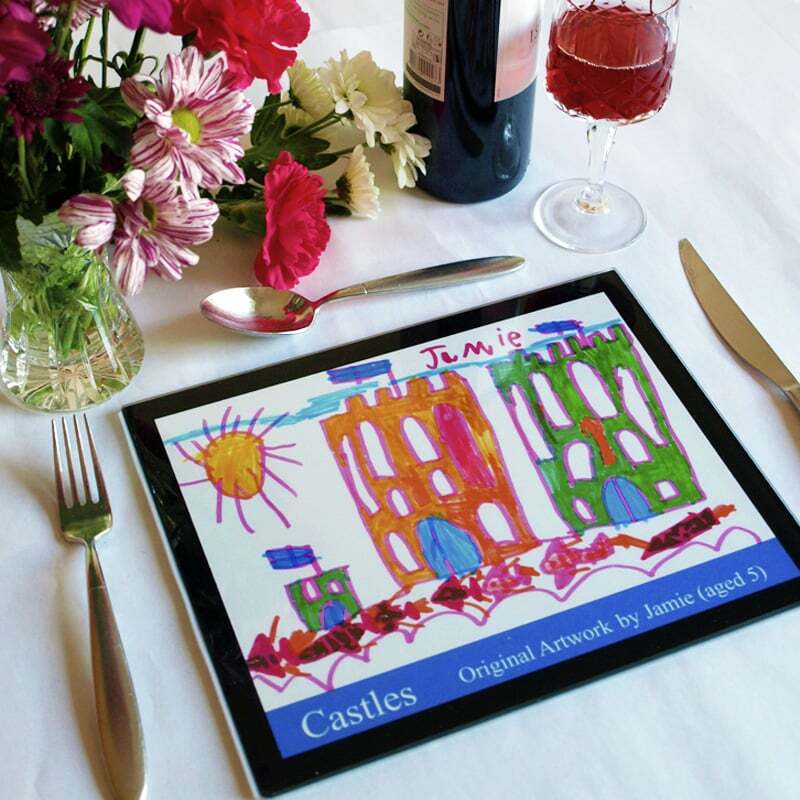 There are many companies that turn photos into fun items such as phone cases, placemats, and notepads. As for medals, simply shorten the ribbon and use it as holiday decoration. Or even better, take a photo of your child with the trophy or medal and make that into any kind of keepsake you want. If your kiddo really wants to hold on to the real thing, a simple, inexpensive glass or plastic jar can be decorated with ribbon or washi tape to create a cute showcase for medals in minutes. 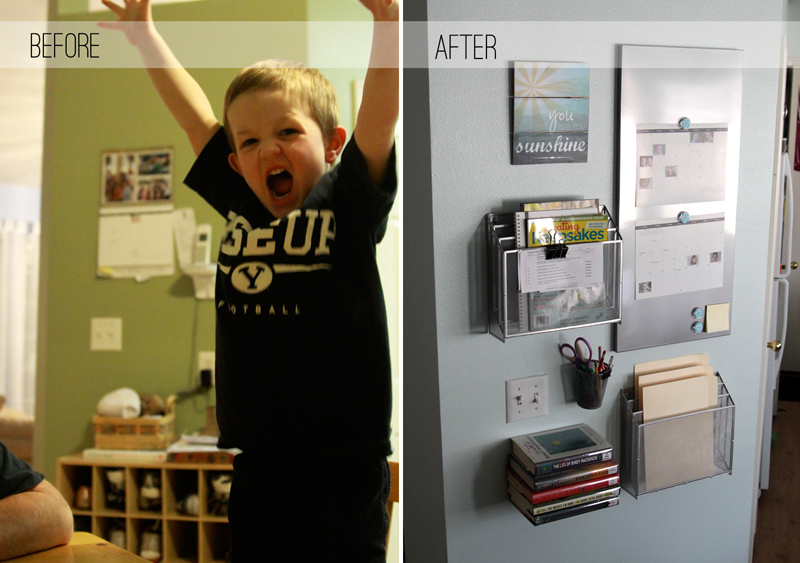 I hope this post inspires you to take action in your home and conquer the kid clutter! It might be a bit of work to get things where they need to be, but it will be worth it when you are able to cut down the time you spend tidying up and looking for things on a day-to-day basis.